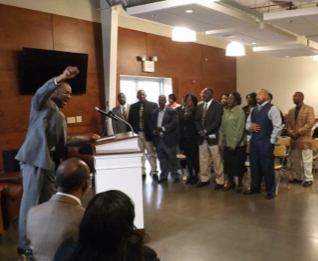 Before I heard the words, I knew something was unique about Atlanta Center for Self Sufficiency’s 29th Graduating Class. There was something contagious and prideful in the widths of their smiles. The way they held their heads up high made them all appear taller than anyone else in the room. At a March 22 graduation ceremony held at the Atlanta, Mission, Class 29 had earned bragging rights that day, with the highest graduation rate of any ACSS class. Many of the graduates obtained employment prior to graduation and still had perfect attendance records. In the weeks leading up to graduation, members of each ACSS class are taught job-related skills as well as proficiencies for obtaining employment, such as help with resumes and how to answer tough interview questions. It was quickly apparent why Danny Tennial was nominated for Class President and chosen to speak at graduation. 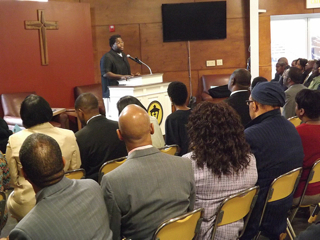 He was a vibrant and enthusiastic speaker, who both amused and captivated the audience. 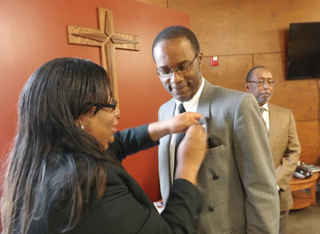 Keynote speaker Maurice Novembre spoke humbly of his fall from grace. He worked in web design and media format for SDK International and had credits in the movie Hope. He got involved in what he called some “unsavory women and activities” and two years later, at age 25, was living out of his car. 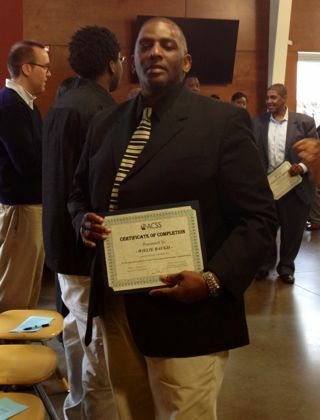 With the help of ACSS, and a couple of years of hard work and determination, he obtained employment in the mailroom for a company. Novembre has no plans to stay in the mailroom. But he is working very hard while he is there and learning as much as he can about the organization. His short-term goals include obtaining a management position in the organization. And his long-term goals include owning his own company. However, he does not want to be boss; he wants to be a leader. 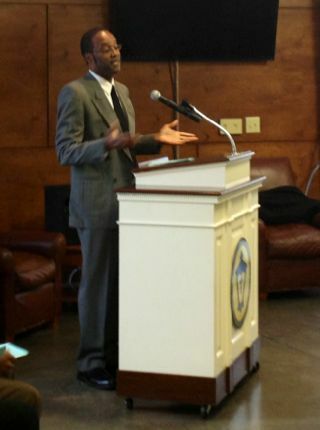 At the end of the graduation ceremony, Dana Johnson, CEO and president of ACSS, made closing remarks. 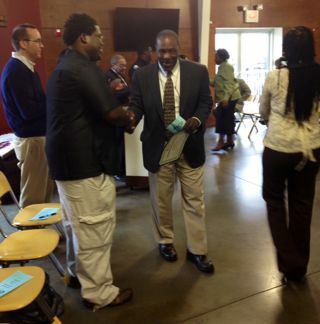 Past graduates of the ACSS program were recognized. As only a witness to this graduation, and an ACSS volunteer, I was proud of these graduates who worked so hard to change their lives. Change is hard. It takes courage, determination and strength. From what I saw of Class 29, they have all of these things and so much more. ACSS is always looking for more volunteers. You can make a difference to help change someone’s life, and volunteering makes you feel good! Please visit us online to learn more about volunteer opportunities with ACSS. Cafe 458: It Just Gets Better and Better! Having had such a wonderful brunch on March 3rd, I was back the following Sunday to sample more of Chef Tiffany’s inventive menu. This time, I brought my nephew Mark who was visiting Georgia for the first time. Like me, Mark is a Yankee from Connecticut and wanted to sample some good Southern food. We agreed that Café 458 was the right place for it. First, I must congratulate the volunteer wait staff from Emory University. They all were so pleasant and were obviously enjoying themselves. Our server, Joy, lived up to her name. Mark was over the moon about his shrimp and grits entrée and it did look and smell delicious. The recipe, from Chef Tiffany’s Grandma Mary, calls for Gouda cheese in the grits and it added just the right touch. The grits were smooth and cooked to perfection. I decided to try an omelet and it was beautifully prepared. The vegetables were fresh and it was all completely yummy! Friends stopped by to meet Mark, including Anthony, Dana and Eric. Everyone knows your name at Café 458! 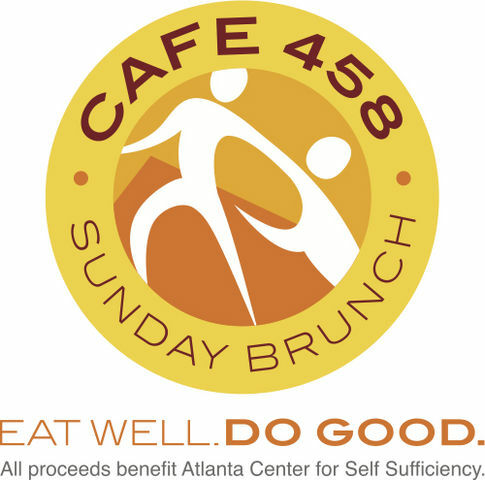 Café 458 is part of Atlanta Center for Self-Sufficiency and all proceeds, including tips, support programs that support our mission to end homelessness. You can make reservations or check out the Cafe 458 menu online. 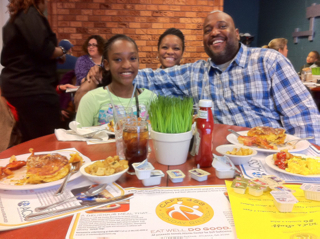 Serving at Sunday brunches is a great way to enhance the fellowship of church groups, to build teams at work and to experience outreach in our own community. To volunteer, contact Alison Smith: Alison.Smith@atlantacss.org. Come on down to Atlanta’s historic Old Fourth Ward and enjoy Café 458’s own special brand of Southern comfort food – with a twist! Cafe 458: It’s So Tasty! The grand re-opening of Café 458’s popular Sunday Brunch more than lived up to expectations last Sunday (March 1st). 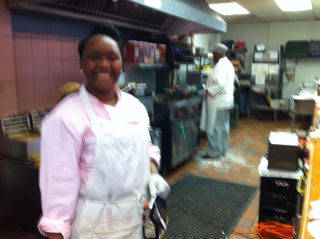 Things were bustling in the kitchen where Chef Tiffany Wills kept everything under control, in addition to dishing out some wonderful brunch items. 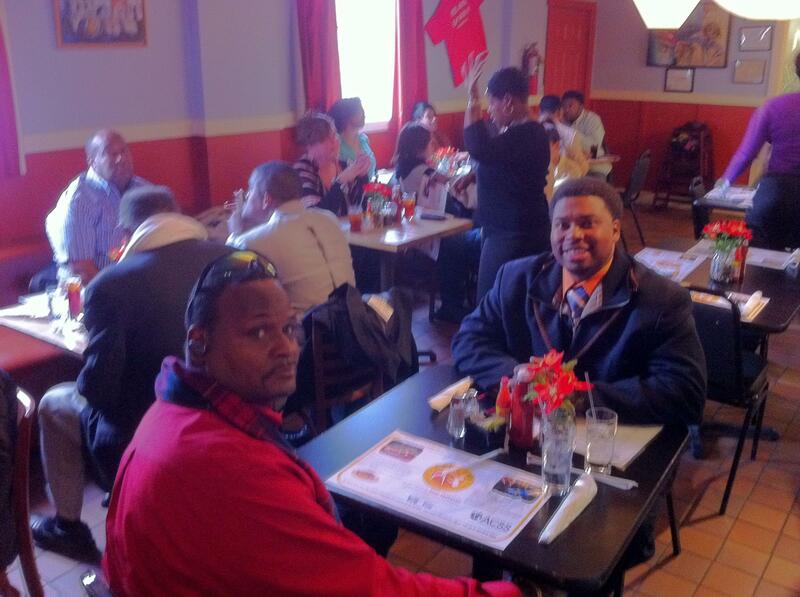 Church group in Cafe 458’s overflow dining area: a great spot for gatherings. The renovations that kept Café 458 closed for a while really made a difference to the overall ambience. It was a great idea to expand the dining area into the front room of 458 Edgewood Ave., which is light and bright. But, the overflow dining area was needed, as well, when a church group arrived after services to sample some of the wonderful options that Chef Tiffany and her staff had prepared. Here is what I loved about the brunch (I’ll get to the food and service later): a diverse group of diners, all happily greeting each other and stopping by tables to spend a little time chatting and socializing. That’s what I’ve always thought the Café was and should be: It’s a great place to meet, socialize, have great food and do good. The doing good part is because all proceeds, including 100% of the tips, provide funding for the Atlanta Center for Self Sufficiency’s programs to end homelessness and provide life stabilization opportunities for its clients. Now, the food! I had the asparagus and sun-dried tomato frittata and a biscuit. And nothing about that dish disappointed me. The coffee was hot and delicious and my cup was refilled several times during my meal. It was beautifully presented and served with great professionalism by a team of volunteers from Georgia Tech (Go Jackets!). Cafe 458 guests enjoy a larger, brighter main dining room. Here is a challenge to other area universities: Gather up your own volunteer team of servers, because you will have a wonderful day. And when it’s done well, as it was on March 1st, the service at Café 458 rivals that of any other bistro at which I have had brunch! Frankly, I can’t wait to sample the other brunch items on the Café 458 menu next week and on as many Sundays as I can make it to the historic Old Fourth Ward neighborhood. You can make reservations online and view the Cafe 458 menu here. To volunteer, contact Alison Smith at: Alison.Smith@atlantacss.org. Trust me, you will not be disappointed! Fried chicken and waffles anyone?